Since 1960 the manufactory Gunther Wagner is producing pens with cartridge system. 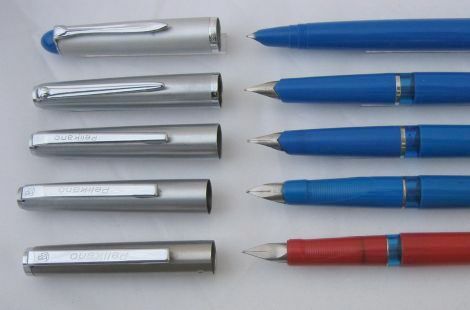 First models were P 15 and P 25 and especially the student pen Pelikano. This site only works with the model Pelikano. To see the differences between the former Pelikano models here a small chronology of this successful student pen. 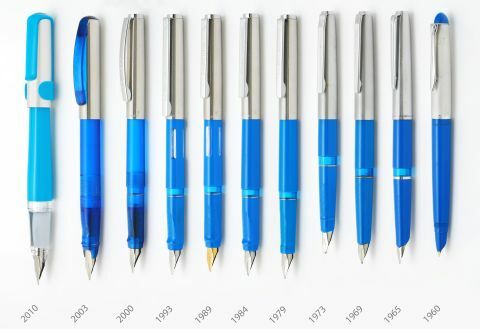 Zum 50 jährigen Jubiläum des legendären Pelikano Schulfüllers brachte Pelikan ein völlig neues, verändertes Design auf den Markt. Das Griffstück ist transparent mit drei Griffmulden und gibt Sicht auf den Tintenstand. In Spring 2015 Pelikan released a new modified version of the Pelikano student fountain pen. The grip is no more transparent, but now colored like the barrel. Also is a oblong sized ink windows in the barrel to see the amount of ink. The design of the cap is unchanged. By March 2017 Pelikan released a brand-new fountain pen for young people and young people at heart. It is an aluminium fountain pen of high quality in a modern metallic look.